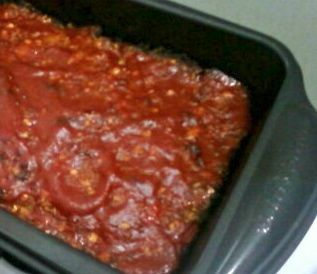 Last year I posted a vegetarian meatloaf that I made for my vegetarian daughter that even my red-meat loving husband would eat. Shortly afterwards, my husband and I gave up meat as well, so the vegetarian meatloaf has become a staple in our house. Without the fat from ground beef, the soy crumbles just didn’t want to stick together. It wasn’t pretty, but it was delicious. I have tinkered with the recipe over the last few months to try to keep it from falling apart after slicing, and last night it came out PERFECTLY! I’ve had several people ask for the recipe lately, so I’m posting the latest version. I also made Brussel Sprouts. I think Brussel Sprouts are the new Sun-Dried Tomatoes. They are EVERYWHERE! Top Chef, Magazines, Restaurants…every menu I’ve looked at lately has them. I think chefs have finally figured out how to cook them. The boiling and steaming that we did 20 years ago just intensified the rubber shoe taste, so I was firmly in the ‘I DON’T LIKE BRUSSEL SPROUTS’ camp. But a couple of years ago I tried some at ChaCha’s restaurant here in Nashville, and my eyes were opened to the yumminess that comes from letting them caramelize, and sweeten, thus eliminating the bitterness of the past. 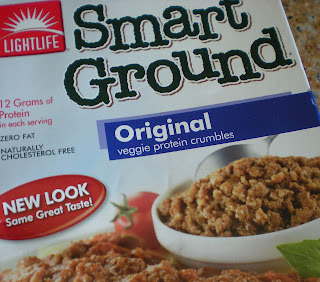 My problem in cooking them is since we are meat-free in our house now, I had to find a way to cook them without the bacon drippings that made them so good. I’ve tried roasting them a couple of times, but didn’t use enough oil (my go-to spray on Pam wasn’t sufficient), so they just dried up and didn’t taste like anything. Last night I didn’t spray the oil on, I tossed them with 2-3 Tbsp. of olive oil. (I had a pretty big bunch of sprouts…it doesn’t take a whole lot of oil, just enough to lightly coat them). While they were roasting at 350 degrees (cut side up for 20 minutes, then cut side down for the rest of the time), I sauteed a large red onion with garlic, pine nuts and rosemary, then tossed them together and voila…they were amazing! Almost as good as the huge bowl I ate at ABC Kitchen in NYC this week! My husband and daughter, who have not jumped on the brussel sprouts bandwagon with me, even ate a couple, which was a success in my book. They didn’t eat a lot, but that just meant…more for me! 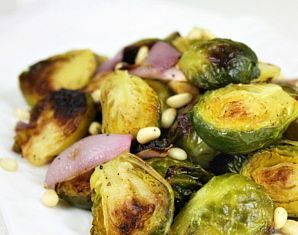 I use small brussel sprouts, pull off the outer edges, trim the stem a little and cut in half. 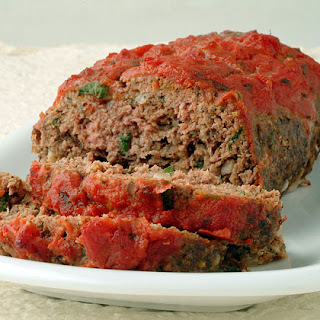 My husband and I absolutely adored this meatloaf. Thank you so much for posting!